PdG's 2016 Favourite Aunties and Old Comrades Reunion Tour: The most exotic place yet? After just over a week with Shane and Brukty in Addis Ababa - playing nanny to their kids, welcoming in the Ethiopian year 2009 (more about that later) and getting over some health issues - I'm now in Harar, a city in the east of the country. Time is running out so I flew to the nearest big city, Dire Dawa, instead of taking a 12-hour bus ride. Harar couldn't be more different from Addis Ababa. 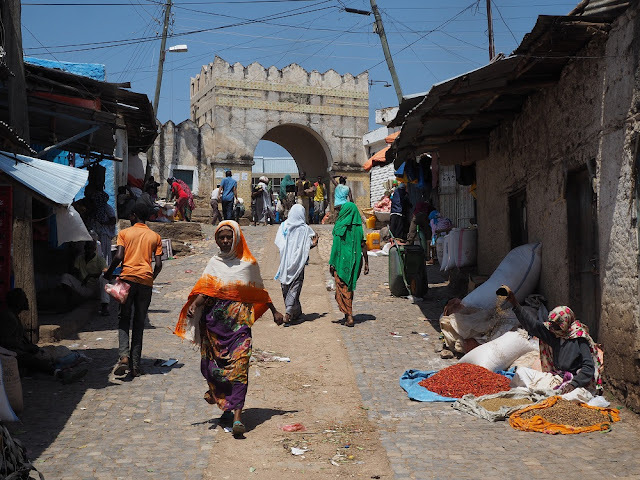 While Addis is green and wet, especialy now at the tail end of the rainy season, Harar is hot and surrounded by dry scrubland. The people here are Muslim rather than Orthodox Christian, and I have to learn a whole new bunch of phrases - people here speak Oromo, which is unrelated to the Amharic spoken in the capital. But mostly this place feels totally different. With its twisting alleyways, spice markets, pastel-coloured houses and brightly dressed women like flocks of tropical birds, it feels more like Morocco than anywhere I've been in sub-Saharan Africa. Plus the coffee is reputed to be the best in Ethiopia - and that's saying something.